3. You have the right to access the personal data a company/organisation holds on you, at any time. If the data is no longer necessary, you can ask the company/organisation to delete it. If you initially gave the company/organisation more data than was necessary for receiving the service (e.g. for marketing purposes), but no longer want them to have this data, you can ask them to delete it. 4. You have the right to use a service without giving away additional data. If a company/organisation wants to process personal data that is not strictly necessary for the provision of a particular service (e.g. a transport app that wants access to your phone’s contact list), they need to get your explicit consent to process that data. Note that even if a company believes that certain data is in their interest to process, this does not always mean that it is necessary. If you have already consented to the processing of additional data, you can always withdraw this consent. 5. With automated decisions, you have the right to explanation and human intervention. If a decision has been made about you through automatic mechanisms, you have the right to know how the decision was made (i.e. you are entitled to an explanation of the logic behind the mechanism used). When it comes to automated decision-making, you have a right to human intervention, and the right to contest any decision made. 6. How will these rights be enforced? 7. Do I need to do anything? For the services you’re using at the moment: Are you still comfortable with the way the company/ organisation collects, analyses and shares your personal data? If you no longer agree, you can simply say “no”. 8. Does it mean I can “delete” myself? Not quite. You can’t delete all your personal data whenever you want to. 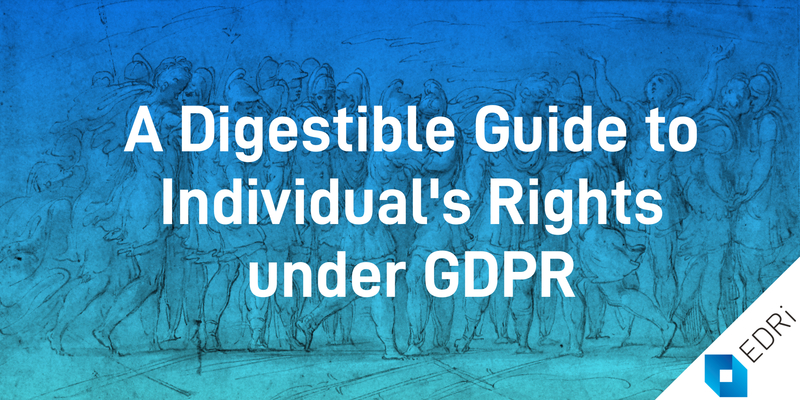 But you can ask to have your data deleted in a few specific situations – for example if a company/organisation no longer needs it it in order to provide the service you are using, or if you decide to withdraw your consent. However, even in such cases, companies may still have viable reasons to keep your data, for example for tax purposes or to protect themselves from possible future claims. 9. Can I talk to companies about their use of my data? 10. What can I do if a company is using my personal data against my will? It may be useful to contact the company itself first. Regardless of whether you do that, however, you can also file a complaint with your national Data Protection Authority – even if the company does not have an office in your country. And if you’re not satisfied with the DPA’s decision, you can take the company to court. 11. Why are some companies critical of the GDPR? Many companies have become used to treating your data as a ‘free resource’ – something they could take without asking permission and exploit for their own financial gain; something they could collect without limit, without protecting it. 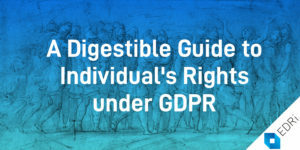 The GDPR is a powerful tool to force companies to re-evaluate the risks involved – not just to the individuals whose data they process, but also to themselves, in terms of fines and loss of customer trust – and to treat your data with the common-sense care and respect that should really have been in place from the beginning. 12. Does the GDPR apply to the data my employer has on me? 13. Does the GDPR apply to US companies? Yes. As soon as a company monitors or tracks the behaviour of internet users on EU territory, the regulation will kick in – no matter where the company is based.